The Ford Freestyle is marketed as the adventure companion you’ve always wanted, is it so? This is the Ford Freestyle and Ford wants you to know that this is not just another hatchback made to look bulkier. And on the face of it, it does look true. The Freestyle, though based on the Figo hatchback, has a 30mm wider front track, sits 16mm taller, has usable roof rails and gets SUV-like design to make it look and feel more like a crossover. Most importantly, the Freestyle debuts Ford’s 1.2-litre ‘Dragon’ 3-cylinder naturally aspirated petrol engine which promise more of everything. Does the Freestyle have what it takes to stand out from the crowd or is it a case of doing too less too late? - Freestyle looks sporty and tough with blacked out headlamps, bumper inserts, all-around cladding, window lining, ORVM covers and stickers on the doors. There is no denying the fact that the Freestyle is the Figo dressed up to look like an SUV. The raised suspension, blacked out elements all around, larger 15-inch wheels and those bright silver roof rails do actually help the Freestyle look like a crossover. But that’s about that. Ford opting to not put some styling elements like LED DRLs on the Freestyle, something that's offered by the competition. Also, the Freestyle isn't available with projector headlamps or LED tail lamps - design trends which have captured the imagination of the buyers in this segment. There’s also that all new 6.5-inch touchscreen which adds to the premiumness of the Freestyle’s cabin and gets rid of those messy infotainment console from the Figo. The screen is responsive, the different menus and submenus are large and legible, Apple CarPlay and Android Auto connectivity adds a lot of usability and the Freestyle also gets a useful rear-view camera with grid-display for safer parking/reversing. Apart from the 6.5-inch screen, new fabric seat covers, start/stop button, rubber mats and small details like additional USB ports on the lower front console, the addition of an ‘Auto’ setting for the headlamps and wipers are some other features that set the Freestyle apart from the Figo. But, aside from this, the Freestyle is no different than the Figo. What is most disappointing is that the issues that plagued the Figo have not been addressed. The plastics on the dashboard and the door pads still feel sub-par. While the front seats are well contoured, they do not provide enough support while taking corners. The rear bench is flat to help accommodate three people more easily, if need be, but the fixed headrests are not comfortable to use in the longer run. There are no storage spaces on the rear doors and there are no rear A/C vents too. The Freestyle needs a more powerful A/C, running the system at full blast in the ‘low’ temperature setting couldn’t cool down the cabin enough during our mid-afternoon photoshoot session. Long trips with the family will see everyone eyeing the front passenger seat after every stop. - Peppy performance for city use! - To hustle, just rev it up! By now you may know that Ford is replacing its Ti-VCT petrol siblings, the 1.2-litre, 4-cylinder and 1.5-litre, 4-cylinder engines with a new 1.2-litre, 3-cylinder ‘Dragon’ series of engines in the Figo range, beginning with the Freestyle. Driving the Freestyle petrol reminds you of small petrol cars of yesteryears, like the Maruti Suzuki Zen. Everyday driveability is brilliant, with the Freestyle not complaining even if you potter around town at 30kmph in 3rd gear and the new Getrag 5-speed manual gearbox is super easy to shift if things do get too slow for your liking. Old-school engine lovers will love the way this engine revs all the way to almost 7,000rpm with the engine note getting raspier with every revolution. The Freestyle’s engine is more powerful (+8PS) and more torquey (+8Nm) than the older 1.2-litre motor but develops 16PS less power and 16Nm less torque than the older 1.5-litre engine. The Freestyle manages the 0-100kmph run in 13.07s, the quickest in the segment if you discount cars powered by larger capacity engines like the Etios Cross. As tested, the Freestyle petrol returns 13.5kmpl in the city and an impressive 19.19kmpl on the highway. The Freestyle then is easy to drive in the city but needs to be pushed to feel the ‘josh’. The Ford Figo was softened to make it more appealing to the masses, the driving enthusiast has the option of choosing the Figo S. What does the Freestyle owner want then? Assuming the adventure seekers are not prioritising on-road handling, it would be comfort and drivability that they seek. And the Freestyle delivers on those counts. The suspension is pliant at all speeds over varied road conditions, with only the nastiest of bumps being transmitted into the cabin. 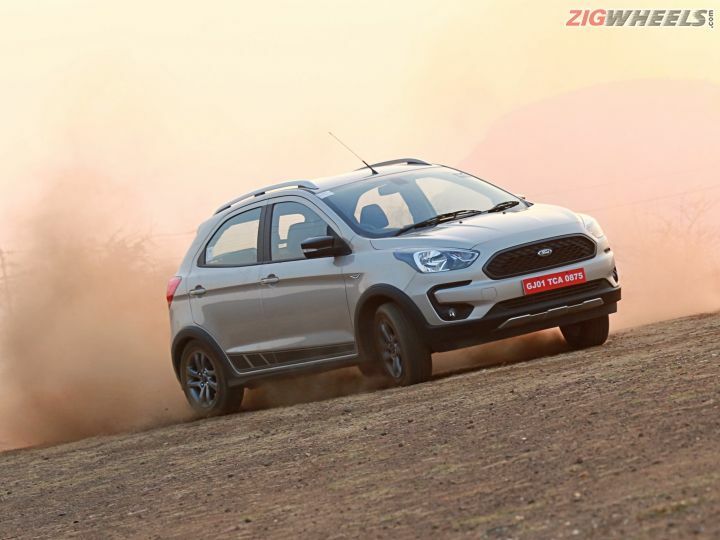 What is surprising is how Ford has managed to control the side-to-side rocking motion which many hatchback-based crossovers suffer from, even a series of bumps fail to unsettle the Freestyle. The Ford Freestyle’s suspension setup is what Honda should have done to the WR-V. Keep it soft but not as soft as to make it uncomfortable at higher speeds. The soft suspension also works well in soft-roading situations where you need a bit of suspension travel to take out sudden undulations, the softer suspension also potentially improves traction. What Ford aficionados may not like is the softer steering setup on the Freestyle. It is great for driving the car effortlessly in the city and weighs up nicely as speeds increase too, but suffers from that ‘unconnected’ feeling found in steerings tuned for comfort. For everyone else, the Freestyle’s steering is just fine. Ford’s image as a maker of safe cars will only be enhanced with the Freestyle. ABS, dual-airbags, rear parking sensors and auto door-locks are offered as standard on the Freestyle. A rearview camera is offered from the second-from-base Trend variant onwards, and ACP is offered on the Titanium and Titanium+ variants. Ford’s signature and segment-unique 6-airbag setup and emergency assistance are limited to the Titanium+ variant. As a package, the Ford Freestyle definitely bridges the gap between hatchback trying to act like crossovers and the proper crossovers. With a raised suspension, comprehensive body cladding, functional roof rails, functional floor mats and improved safety systems the Freestyle sets itself apart from cars like the i20 Active and Etios Cross but retains the compact dimensions of the Figo to make it suitable for the urban jungle. The new ‘Dragon’ petrol motor makes the Freestyle feel even more special, being frugal and easy to drive when you need it to and delivering a good punch when you want it to. What makes the Freestyle Petrol Titanium+ the most attractive package is the price - at Rs 6.94 lakh, ex-showroom Delhi, the Freestyle feels like the car you should not only choose over the Figo but also over most of the competition. The only reasons for you to not choose the Freestyle would be the low quality plastics and rear seat practicality.